Fly fishing tips to catch more winter trout in Bryson City, NC Smokies! There are many benefits of pursuing trout in cold Winter waters. As the water temperature drops the trout tend to favor new holding water. Structure and slower water currents tend to rule for determining where they will be resting. The water type tends to be near two feet per second in flow rate with a minimum of 2 to 5 feet in depth. This water type tends to hold the majority of numbers through the winter season. The flies tend to be smaller (18-24) during the winter months with predominately BWO’s and midges. Stomach samples will teach this to you in a hurry during the winter. Do not neglect fishing the film during the Winter especially if you can see trout activity near the surface feeding! It has long been one of the favorite things of the year! Marking active fish and covering the rise forms is technical fishing hence the challenges increase! The use of long leaders will make this task easier for getting drifts and help to minimize spooking wary fish. A long leader is no doubt relative to your casting abilities so this will vary. I have been using a 10’6 fly rod with a #3 weight line the past few winters with a leader around 30 feet in length. This increase in stealth helps to minimize spooking wary fish. Water levels tend to be lower in Winter so stealth should increase! Wear drab clothing that blends in with your surroundings! 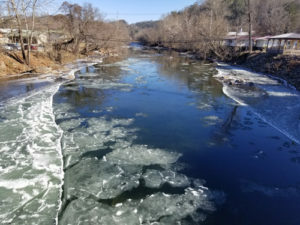 Delayed Harvest waters of the Tuckasegee River in Bryson City can be epic over the winter months! Slow down is really one of the biggest lessons you will come away fly fishing the colder months. Active fish feeding in the film tends to be on “high alert” mode most of the time! When you land a fish take a few minute break and observe the other riseforms! The more you observe and cast less the better your overall results will become during the winter months. Tippet sizes are smaller and will vary depending on water type. It is common to use 6-8X fluorocarbon throughout the winter. Regular nylon in 6-8X for fishing higher in the film. Also, have some “mud” (aids in sinking tippet) and some Mucillen (tippet grease too float) to make fine adjustments. The three fly rig is my preferred method because it enables me to grid off sections of water in less time. Fly patterns include tiny CDC Puff Dries, parachute dries, wets for emergers, pheasant tails, ju-ju’s, Egan’s Rainbow Warrior and Iron Lotus, and dozens more! Most important thing is to keep them SMALL! Winter trout fishing will assist with your water reading skills as well! Right now we have had a week of single digit temps here in Bryson City. All the rivers have ice features in the water. The slower currents tend to freeze over while the faster currents move with ice chunks floating. If you live close to trout water, take some pics! These can be great learning tools for discerning the currents. There are many underwater Springs in the Smokies that provide warmer water temps for trout to feed. Look for these by looking for fog near the banks for gaining the clues. The last tip is after a long cold snap and the weather jumps in temps-GET OUT THERE! These times tend to produce the best winter fishing of the season. Think of it as fish are in survival mode during the lethargic 33-35 degree water temps. Once the temps bump up a few degrees it is usually “GAME ON”.